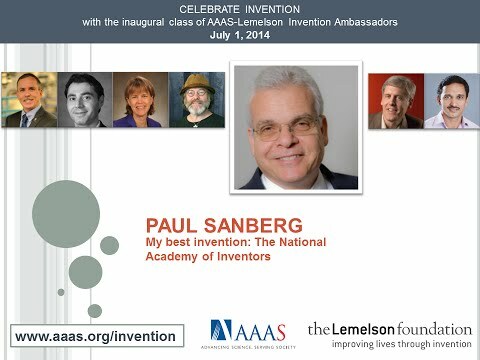 Founder and president of the National Academy of Inventors. He is Senior Vice President for Research & Innovation, Distinguished University Professor, and Executive Director of the Center of Excellence for Aging and Brain Repair at the University of South Florida, and founder and president of the National Academy of Inventors. He trained at York University, the University of British Columbia, the Australian National University and Johns Hopkins University School of Medicine, among others. He has held academic positions at Ohio University, the University of Cincinnati, and Brown University. He is an inventor on approximately 100 health-related patents. His work has been instrumental in translating new pharmaceutical and cellular therapeutics to clinical trials and commercialization for Tourette syndrome, stroke, ALS, Alzheimer’s, Huntington’s, and Parkinson’s disease and he has significant biotech and pharmaceutical industry experience in these areas. He is the co-founder of Saneron CCEL Therapeutics, Inc. and Natura Therapeutics, in Tampa, and Stem Cells, Inc., in Palo Alto, California. He is the author of more than 600 scientific publications and is considered a highly cited scientist, with more than 20,000 citations to his published work. He serves on editorial boards for more than 30 scientific journals and has received numerous scientific awards. He is a Fellow of the AAAS, a Charter Fellow of the National Academy of Inventors, and serves on the evaluation committee of the National Medal of Technology and Innovation.